A custom-built motion control system in no time! 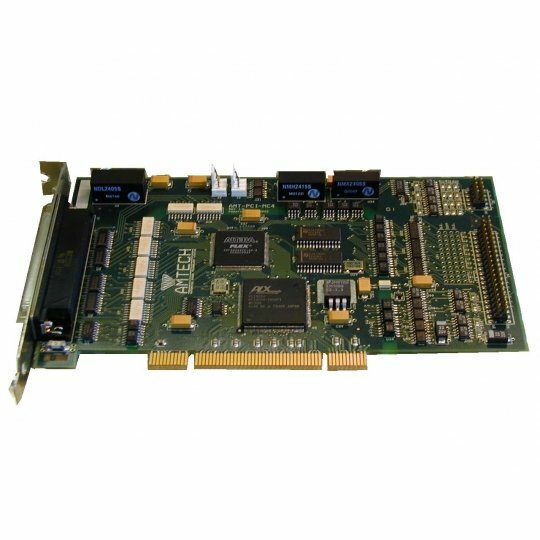 Motion Control Products New PCI MOTION CONTROL CARD AMT-PCI-MC4 and GNC LITE FOR WINDOWS software will allow you to quickly build a control system to your own specific needs. The flexibility to offer you a simple single axis control or multi axis motion control system. The user friendly operator interface is created using a selection of fonts, colour's and bitmaps giving a unique custom feel. Displaying as much or as little information as you choose, making operator training quick and easy. Motion Controls latest PC based 32 bit PCI motion control card AMT-PCI-MC4 is a truly industrial motion control board with ground braking features and price performance. The card has both four axes of servo and four axes of stepper control, with upto 16 digital outputs and 16 digital inputs and all come with a high level of protection against noise. The control card can also have fitted an optional dual CAN interface and upto four channels of analog input. This AMT-PCI-MC4-S is supplied with Windows drivers and a DLL for customers who want to create there own Windows applications or Amtech's own GNC for Windows control software can be purchased. Because the speed of part program generation is one of the most important parts of an efficient control system; GNC comes with a DXF or HPGL interface program converter. This allows CAD systems to interface directly to GNC. You can produce a DXF or HPGL file on your CAD system and then pass it to GNC for immediate conversion, allowing the operator to select a start point and directions. GNC will also allow the automatic addition of a 3rd dimension such as the raising or lowering of a cutting head, thus converting a 2D CAD drawing into a 21/2D program. Watch Dog Timer (capable of resetting the onboard logic to a safe power up state on a processor lockup. * Please specify the control type (stepper or servo) when ordering the relay interface. ** Estimated dispatch time for this controller: 4-5 working days from the date of purchase. This relay interface board (for stepper and servo) is a simple and cost effective way to interface the AMT-PCI-MC4 Servo or stepper card to system wiring and control equipment.